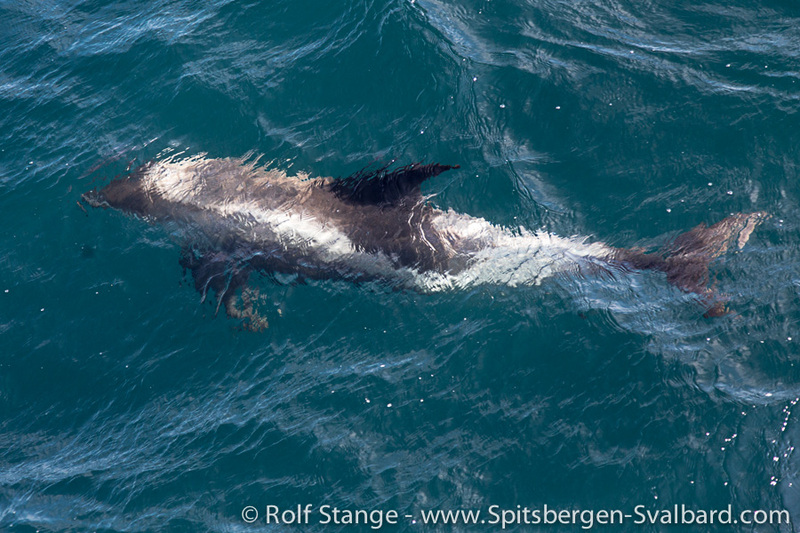 White-beaked dolphin between Iceland and Jan Mayen. Description: Adult White-beaked dolphins are between 2,5-3 m long and 350 kg in weight, but they appear weightless as they jump out of the water. 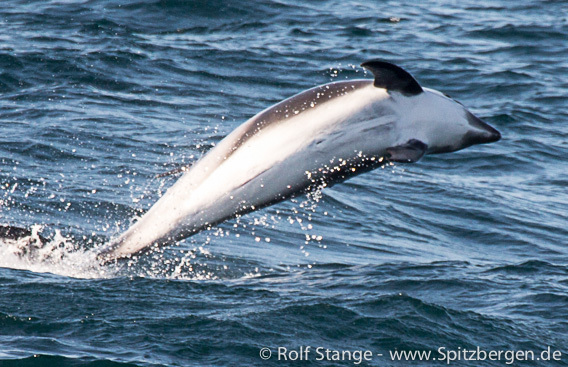 This creamish-white snout (not always very clear) and the more northerly distribution area help to tell it apart from their similar cousin, the Atlantic white-sided dolphin. 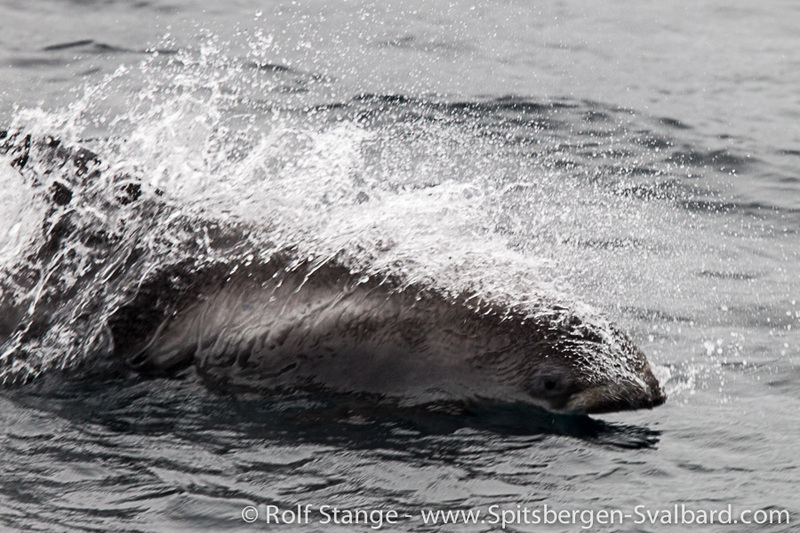 On its sides, the White-beaked dolphin has got 2 white areas, which vary in shape and size. 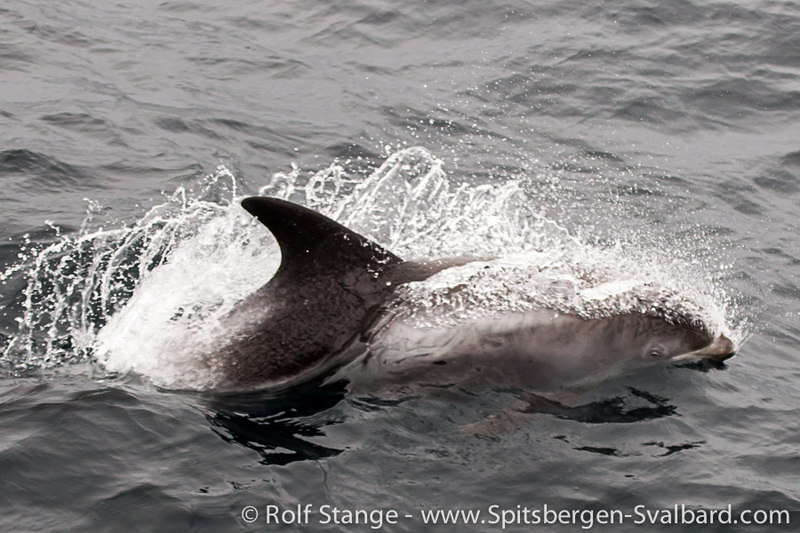 White-beaked dolphin south of Bjørnøya. 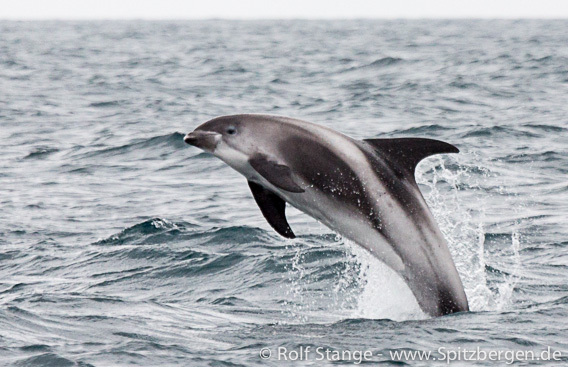 Distribution / Migrations: White-beaked dolphins appear everywhere in the north Atlantic, from Newfoundland to the Kara Sea. 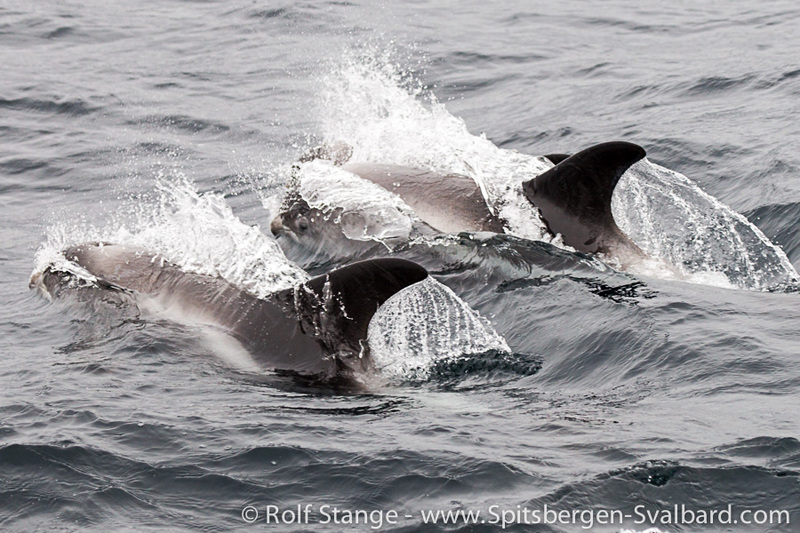 They are abundant off most northern European coasts. 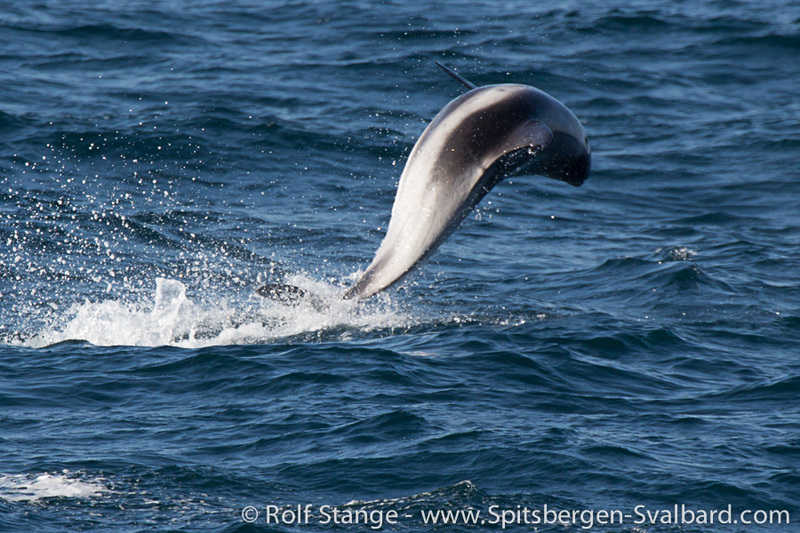 There are occasional sightings from the western Baltic Sea, and it is common in Norwegian waters. During the summer, the species migrates northwards, up to the pack ice edge. 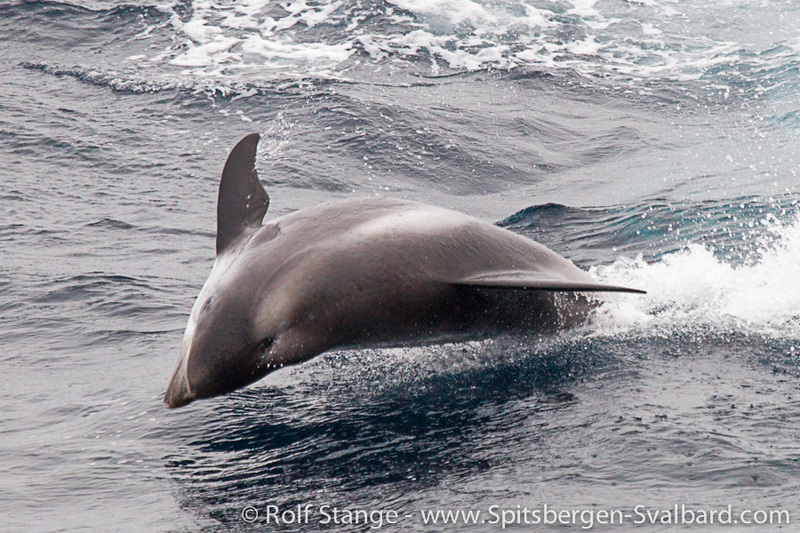 In a Spitsbergen context, White-beaked dolphins are often observed during crossings from Norway to Bjørnøya and up to Spitsbergen, but they don’t usually enter the fjords. Biology: Surprisingly little is known about this very abundant dolphin. The calf, 1.2 m long, is born in late summer. They feed on a range of fish and squid. Miscellaneous: White-beaked dolphins are usually seen in groups from a few dozen to many hundreds of animals. They are very lively and curious, often riding the bow wave of ships for a while and displaying beautiful, acrobatic jumps. The total population is not known, but estimated at many ten thousands up to several hundred thousands.